My Impressions: Simon Says Stamp Spring Plush Blog Hop (with GIVEAWAYS)! Simon Says Stamp Spring Plush Blog Hop (with GIVEAWAYS)! I'm excited to be joining Simon Says Stamp for their Spring Plush Blog Hop in celebration of their newest release: Spring Plush. You should be arriving from the fabulous Kristina Werner's blog. The great thing about these dies is that you aren't just limited to working with felt. They work great with fun foam, vellum, cardstock and anything else you can cut with dies! For today's hop I wanted to use Simon's Plush Happy Sunshine Dies to create a sunshine card/ hair accessory using felt as well as a graphic card focused on using papers with a few felt embellishments. First, here's the card with removable sunshine hair clip. I doubled up on the yellow felt to give it some sturdiness, hot glued the final project to a hair clip, and cut some slits into the card front for the clip to slide in. The sentiment is from Simon's My Sunshine Stamp Set. Here's my second project, using the large circle from Simon's Plush Happy Sunshine Dies along with various colours of Simon Says Stamp Cardstock. Once I arranged these pieces on my card front, I die cut the smaller circles using the center from Simon's Plush Daisy Dies and some Echo Park Spring 6x6 Papers. I created a few felt embellishments using some of the smaller dies from Simon's Plush Springtime Bunny Dies and their Plush Button Egg Dies. The sentiment is from Simon's Friendship Blooms Stamp Set. 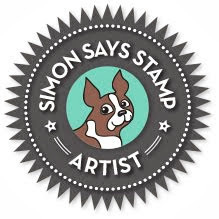 Simon Says Stamp will be giving away a Simon Goody bag on every stop of the hop! Be sure to comment at each stop to increase your chances of winning. 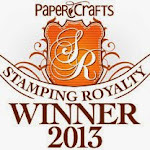 Simon Says Stamp will randomly choose the winners, contact them, and post the winners list on their blog Monday, March 7th. Your next stop is the talented Amy Rysavy's blog. Great ideas. I ordered yesterday for my daughter's birthday. Can't wait for them to arrive. Wonderful ideas. I like vet the cards and the vellum bunnies you made. These dies are so cute. Awesome ideas, I ordered a few things yesterday from this release. Looking forward to their arrival! This is such a cute release!! I love the jelly bean shakers! What cannot be done with these dies? Such cute projects! So many super cute ideas and projects!! I especially love those vellum treat holders!!! Absolutely love your card. The treat bags would be a cute surprise on the Easter table too. You've shown so many ways and mediums to use these fun dies on. I love everything you've created!! I hadn't thought of vellum. That may be the idea I've been looking for! I need birthday party favors. Love your vellum bunnies and awesome cards! Great release! Wow! Your creations are really innovative and fun, Sarah! It is so much fun to see what each designer does with the same products. your little easter treats are adorable - great ideas! Amazing uses of these dies! Too cute! These are so beautiful, the clip is lovely! The circle card is gorgeous! These are so cute SSS has created something very different. I'm loving it. Such great ideas. Love the sunshine hair clip. So creative! Love the vellum bunnies. I love how u put jelly beans in the bunnies. You are so creative! What a great idea to use vellum! That hair clip is adorable and I love the card, too! 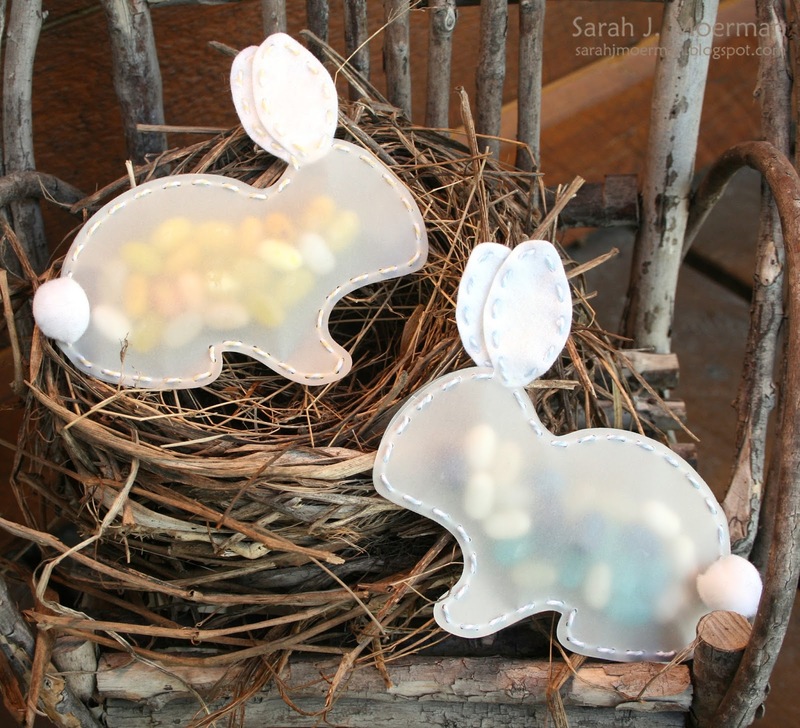 What a sweet idea using vellum for those little bunnies ... my two grandkiddos would ADORE these in their easter baskets ... thank you so much for sharing these lovely projects !!!! Love the creative use of the last circle card! Love the sunshine hair clip! Love all your designs especially the cute Hair Clip!! Love the barrettes! so cute! I love all of these things that you have done! The vellum bunnies are fantastic and the hairbow is adorable! My favorite, though, is the card! Just beautiful!!! Love the idea of the Jelly Belly Bunnies! Thanks! Adorable projects. I would never have thought to use vellum for the little bunnies, but they are darling. You have added some cute items to the cards that are reusable and I really like that. Thanks for sharing. Fantastic projects Sarah. Love the vellum treat bags... and with the holes, they are so easy to stitch! Same with the sun hair clip. LOVE THEM! Neat card with the circles. My grandson Connor says that he really loves the vellum rabbits with the jelly beans inside and that he would like to eat all the jelly beans up!! He is 4 years old. He is staying with me while his mom is in surgery! OMG how cute are those bunnies with jelly beans!!! Great idea. Such wonderful ideas. Love how you made the cards. Really nice. My fav has to be that adorable sunshine. I just love it! Super cute and fun projects! Your projects are so beautifully crafted, love the jelly bean shakers!!! So many wonderful ideas. Love the bunny die cut to use with jelly beans is my favorite. I love all three of your projects! Your card is fantastic! I will be a new subscriber for sure! Great way to package jelly beans!! Very creative!!! What a great way to package up a treat. Might have to do something like that for my students at work. Love the bunnies and the sunshine but the circle card is what really grabbed my attention. Great job on all. What great ideas, thanks for the inspiration, I love these new dies. These bunnies look adorable! Such a cute idea for the hair clip - your young model is precious! 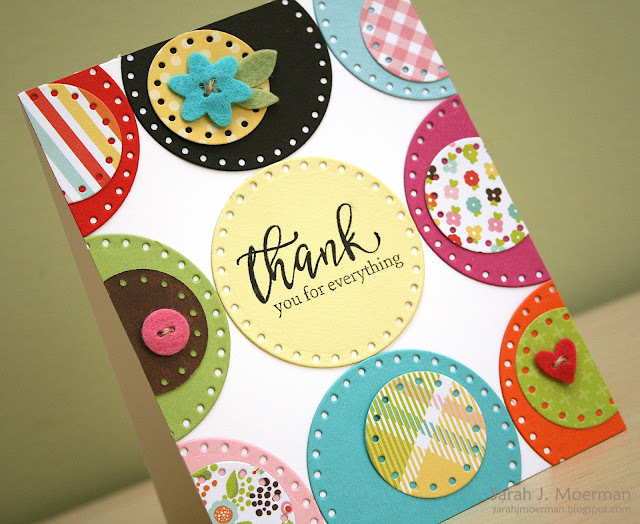 Your card is gorgeous too - love those felties! Love your sweet hair clip...!!! Great ideas. The bunnies are adorable. . Thank you for sharing! So creative, I love how you used the felt on the card as well as the hair pin. I love your second card. So clever. These are super cute!! I gotta have em!! Great projects. Thank you for sharing your creations. Love them. Love the clip idea! Will have to do that for sure! Cute idea with the sunshine hair clip! Love the card using the plush dies as a graphic element! So many great ideas in 1 post!!! Thanks! What cute ideas. Love the sun. You gave some new ideas for using these oh,so cute dies! Thank you. Like how you used the vellum. Like the Spring look. Especially like the sunny sun. Have a BEE-utiful day! All your projects are so adorable. What a great release. What a clever idea to make the vellum candy bags! So cute too! Sarah, each of your ideas are great! Love the Jelly Bean holder and he hairpin is so cute! goodness i love that bright and cheerful card. and, the vellum bunnies? i may just need to borrow that idea! Love the candy filled bunnies and that circle card is fantastic! Great ideas! Too cute!!! Just love the little bunnies, what a cute idea! And the little hair clip for your special someone. Very cute!! Very creative! Any of these dies would make great hair clips. Cute card. Fun ideas! Love those bunny treat pouches! Such cute ideas! I love felt!! Fun projects! Thanks for sharing these great ideas! They're all wonderful, but I really like the vellum bunnies! Wow, so many creative ideas! I love the hair clip, it's adorable! Such a cute idea combing the two components of felt and paper. Loved the vellum idea also. Those bunnies are so adorable! Great ideas for these dies! I love how you showcased them in different ways. love those vellum bunnies and what a special hair clip! You are so creative! How awesome that you made them into little treat holders, something to wear and a card! WOW! Really sweet! Love the release. Incredible talent! I love the jelly bellies inside the bunnies!! Fun shaker and treat!! Wow!!! Absolutely adorable projects!!! And your little "model" is beautiful!!!! I love your jellybean bunnies!!!! In love with all the stitching dies. Every card and project is so cute. Can't wait to add to my die collection. How wonderful - a great idea to make them into little treat bags! I love the card and the little sunshine hair ornament too - thanks for sharing! What a cute idea for your kids! The shaker bunnies are just TOO cute! This new Spring Plush line is absolutely adorable. Thanks so much for giving us all this great inspiration. What a fun blog hop. So cute and super clever ideas! I recently made my granddaughter hair clips with felt animals. She tried to wear all 8 in her hair at the same time (she is two). :) Anyway now she will let us style her hair because she likes the clips so much! Especially love the card. Great idea!! That is one CUTE girl too. The idea of using vellum was brilliant, I must try that. I love the jelly bean rabbits and the adorable sunshine! Such fun projects for Spring! Fabulous variety of projects. I really like the vellum bunnies. Such adorable little shakers and goodies for the girls' hair. There's no end to the possibile creativity with this ADORABLE new release from Simon Says Stamp. I'm smitten! Your projects are so great....love the creativity....love the sun hair clip...great idea! I love this idea, Can not wait to make some! these are all so cute from the vellum bunny treat holders, the hair clip to the card. Great ideas! Love the vellum treat holders, so cute! The cards are gorgeous! Great ideas with these new products! Love what you created with the dies! 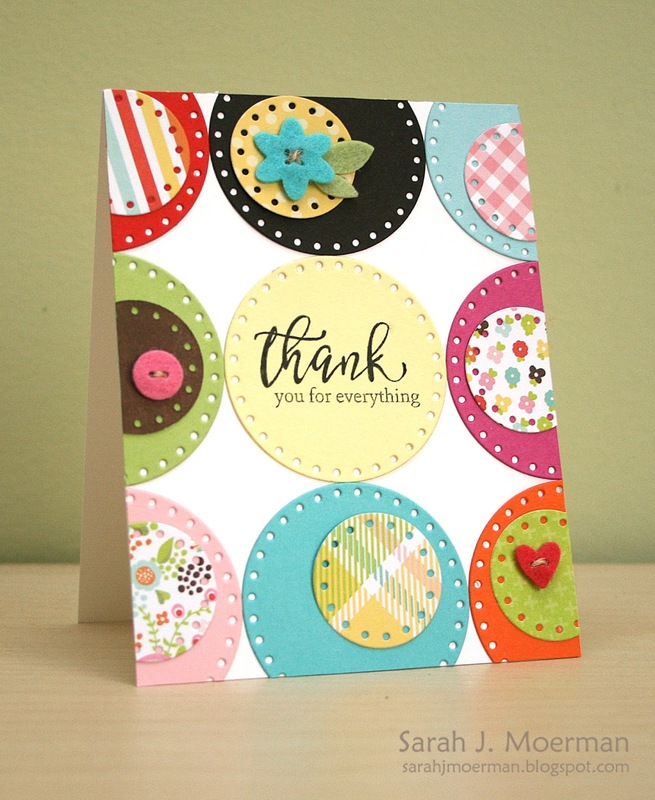 I am in love with that card with all the circles so very much!! That is truly a work of art. TFS! Great projects, they are all so creative and cute! Gorgeous projects! I love all your creativity. Such GREAT projects!! Your little vellum bunny pouches are simply adorable and I love the idea of a removable clip on a card! What a hit! Your circle card is so pretty too! Fun! I love your jelly bean bunnies but I really love your circles card!! It is terrific, thank you. 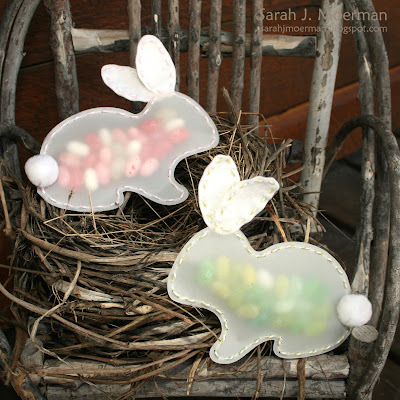 Love the vellum bunnies with the jelly beans! Such a smart and cute idea!! What a cute release. It just says Spring. Oh how cute these all are! wow! Wonderful projects - love your vellum bunnies from the day before too! Thanks so much for sharing! Sarah, I absolutely love those jellybean stuffed rabbits! And how creative using the dies to make a unique bg for your card. Loving these new products. Thanks for the great ideas! 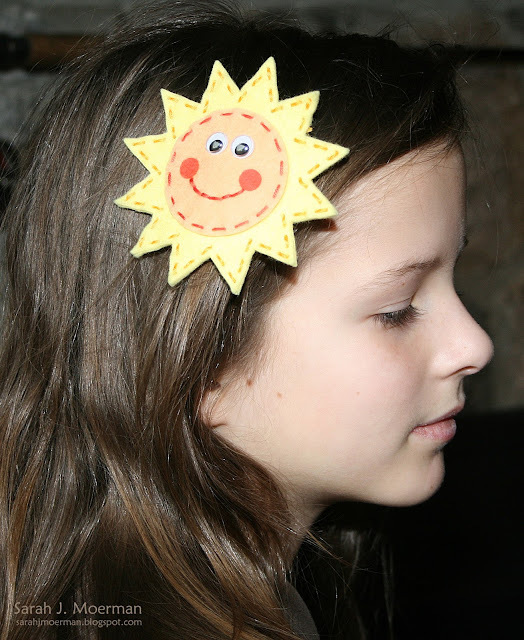 That little sun really makes me smile - and what a fantastic idea to create a hair accessory! What a unique use of these dies. Very cute. Fabulous ideas to use these dies for. Thanks for the inspiration. I really like how you repurposed these into the card and how you used them for a barrette. Cool! What great projects! I never would have thought of cutting out vellum with the dies. It makes the most adorable jelly bean packages! Brilliant! Very clever variations with your projects! Love the barrette. These are all such fabulous ideas!! Love the hair clip and your daughter is gorgeous. And the vellum bunnies are so cute. The dies look fantastic just used with the patterned papers on your card as well. What a fab release!! The vellum bunny treat bags are so fun. Lots of great ideas. Super cute Vellum Bunnies with jelly beans inside! How creative! Thanks for sharing. Such cute, fun an clever ways to use felt. Adorable! Wonderful ideas. Great bunny candy holder and love, love, your card. The bunnies are precious and I love the card with those circles. The hairclip is just so much fun and I love the sun in felt. Fabulous Projects with new dies.So creative. I love the jelly bean shakers.. Thanks for sharing and super great blog hop! I enjoyed all your projects today! Awesome ideas! Love the velum bunnies and the ice card !! Sarah...Adorable project and cards! I love that you show how vellum can be utilized! 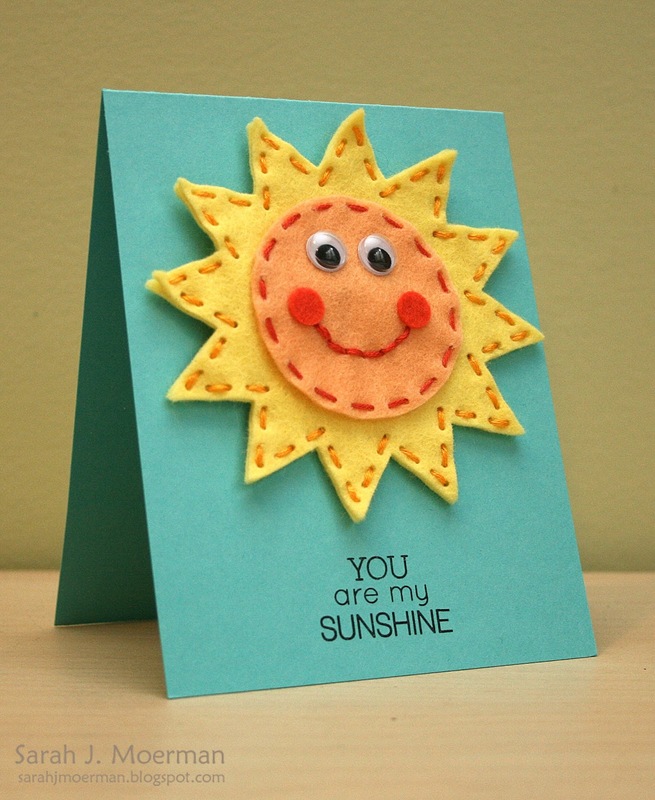 I will definitely be recreating your sunshine card! How smart! Your card is so beautiful! Thanks for the inspiration Sarah! Gee, you have some clever ideas here for Easter! REALLY adorable stuff!! I can see so many uses!!!!! The jelly bean shakers are adorable....but the barrette is to die for! I love those stuffed bunnies. They are so cute. Wonderful projects! Love the hair clip card! Great projects. Love the jelly bean filled bunnies and the sunny hair clip. The card using all the circlesis awesome. Super ideas to use with these dies. What cute creations, I'm loving these plush dies. Wow! Love the vellum bunnies from yesterday! 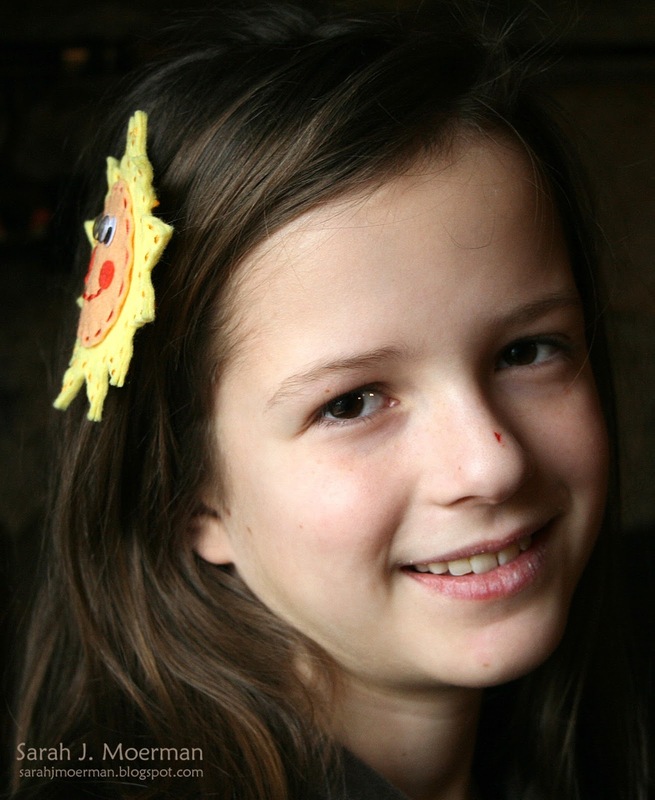 The happy sunshine hair clip is great and your card is just fabulous! Gorgeous ideas! Thanks for sharing! Those vellum bunnies are super cute! Wow, three awesome projects! I'm partial to the candy-stuffed bunnies...very clever! Candy stuffed bunnies.....STOP IT!!! So adorable! OK, so I saw the vellum bunnies and thought that they were oh so cute. Now today you are showing that awesome hair clip (complete with card) and the card. All I can say is WOW. You are so very creative! Thank you for sharing. Your cards are so vibrant and colourful with the circles and patterns! And what a sweet treat for a treasured friend or family member. Love the happy sunshine card. Wow! Everything is so cute! Very adorable hair clip and the cards rock! Such wonderful designs!!! They are all fantastic and really show how versatile these new elements from the SSS release can be! The felt sunshine is equally darling on the card and when it is when being worn as a hair accessory! And I really like the card that using the circle dies, too! They add so much color and dimension to the design!! Great job! Oh Wow!! I would have never thought of using the vellum to make treat holders..super clever!! I also love the idea of the hair clip/card duo..it's so cute! And I have to say the biggest smile came with your last card using all the circles & colors!! I am a such a sucker for clean,simple & colorful! !